When your seat is upright and your tray table is closed, take a look at this…. | I Should be Writing! We sat at the gate for what felt like an eternity. After a while, the Captain came on the intercom and said we weren’t going anywhere at the moment. He stated that the hostages, er, passengers, needed to stay seated and with all electronics off in case we got the word that the winged-pod-of-infection would finally get in the air. Ugh. They wouldn’t let us de-plane nor would they let us unbuckle to answer nature’s call. But worst of all, they wouldn’t let us use our electronics on the off chance that they figured out what the problem was and we’d have to take off immediately and without warning…or something. Well, not having my electronics is a nightmare for me. No iPod? No iPhone? No laptop? No Kindle? I had nothing to do. As if that wasn’t bad enough, they had a ‘looping’ musical score playing in the plane. I am not joking. It wasn’t a song either. It was a piece of “music” about forty seconds long. It was an eerie tune, too. It played like the beginning of a soundtrack from a scary sci-fi flick—all techno and gloomy. I am sure someone in the airline’s corporate headquarters made it policy that they play that music in times of ‘crisis’ to calm the nerves of the savage beasts being held captive. I think it was supposed to be a ‘soothing, soft’ melody. Yeah, well that corporate idiot never had to listen to it for thirty-nine minutes. It began to bore through our brains until it was painful. After a while, the people around me started grumbling about the annoying music. However, we had to remain in our seats, belted and restrained, so no one could even ask the flight attendant to free us from our mind-numbing prison of sound. Sonny, the effervescent flight attendant, was already strapped into his three-point harness ready for the instantaneous take off that was inevitably going to happen without any notice at all. So there I was. The ADHD poster-child without my electronic crack. To top it all off? I was having serious regret over my Venti double-shot Carmel Macchiato that I downed before we boarded. My fingers started drumming on the arm rest; my legs started bouncing up and down and I developed a persistent eye twitch. My patience began to wear thin and the music carved a ravine of pain into the nerve center of my brain. My non-plussed husband fell asleep and left me to my own devices. I needed something. I needed sugar. Yes! The thing that never failed to make me happy. That thought pacified me until I remembered I had left my candy in the carry-on bag that my blissfully-sleeping-other-half had shoved in the overhead bin. What was he thinking? It crossed my mind to quickly unbuckle myself, hop over his long legs, snap open the overhead and grab my bag before anyone could stop me. Maybe I could throw a fistful of M&M’s in my mouth before the Sky Marshalls knocked me down and restrained me for not following the clearly visible, glowing seatbelt sign. I wondered if I could plead insanity caused by that damn obnoxious music. Instead, I pulled the Sky Mall magazine out of the seat pocket. I’d never looked at one before because I am convinced the periodical is covered with Ebola and Swine Flu. I was desperate though. I picked it up with my finger and thumb, careful not to get too many of the foul germs that were at that very moment multiplying by the thousands per second on the flashy cover—a cover depicting a woman listening to her iPod with a look of ecstasy on her face. The airline torture complete—they’re showing the very thing I had been denied—a way to drown out their techno-music. Anyway, I carefully turned the first page using just the tip of my fingers—the tippy tip. Yeah that’s it. And for godsakes whatever you do, don’t lick your finger before you turn the page, I told myself. Just the thought made me want to hurl. I started perusing the magazine and one question persisted the entire time. Who buys this stuff? No, really. I want to know. Obviously, they must have lots of money and if they have that much money…why the hell are they on this godforsaken airline and not on a private jet where they can use whatever electronics they want and someone just might clean the cabin with Lysol once in a while? Here’s an example of consumer insanity I pulled at random just for edification. I’m not kidding you. I opened it up and put my finger on the page without looking just to see what product about which I should blog. Here’s one of my favorites. It’s called the Swoop-n-Scoop cereal bowl (Product OBL191J). This is for real folks. Someone has designed from plastic and pure imagination…a new way to eat your Fruit Loops. This thing is patented so don’t you dare try making one at home in your spare time and in your endless pursuit of non-soggy cereal. This little device has a ledge for your cereal that is a couple of inches higher in the bowl than the milk. See…you pour the milk in the lower portion and take your spoon full of cereal and dip it into the milk below. Ta da! No soaking in all that calcium and vitamin D at all. Just enough milk to wet your Lucky Charms lest they stick to the roof of your mouth and rip up the sensitive skin there. Which also begs me to ask…why in the hell are Captain Crunch squares so damn rough? They can shred your mouth to bits and yet, I eat them all the time. Hmmm…But, I digress. Now with this invention, I can destroy the roof of my mouth with damp cereal instead of wet crunchies–making Captain Crunch the deadliest it’s ever been. How much for this device, you ask? Well, $19.99, of course. What’s fascinating to me is the photograph in the ad. A mother and daughter delight in their new cereal-eating experience. You can just see it in the mother’s face. She’s overjoyed. Just in case you can’t figure out how to use this oh-so-technical device, the picture includes instructions. Cereal here (arrow) and Milk here (another arrow) and just in case you’re still confused how to use it, there is another arrow—a swooping arrow showing you how to move your spoon from one part of the bowl to the other. Yep. “First gather your cereal in your spoon and then”….hold on folks…wait for it… “dip it into the milk.” Wow! I’m sure I would’ve stared at the bowl for hours before I figured out how to use it. Good thing they showed me with arrows AND words! Oh yeah…if you want to save money, you can buy four of these beauties for the marked down price of $59.99. Oh joy! But…what happens if you dip your spoon into the milk first and then go for the cereal? I shudder to think of the results. It baffles the imagination. The very next page of the wonderful Sky Mall catalogue is made to both horrify and mollify an OCD sufferer like myself. It feeds the cycle, I tell you. If you know someone like me, here’s a Christmas gift to consider. It’s guaranteed to completely blow your favorite germ-phobic’s mind. I think I might have shivered in anticipation when I read the description the first time. I thought about waking up my sleeping husband and pointing at the ad. “Honey! Look! You have to see this!” I stopped myself before I elbowed him since a few minutes previous, in my exhuberance to share the experience, I’d jabbed his ribs to show him the cereal bowl. He wasn’t amused. Item ZDH101J is a little miracle do-dad called a Nano-UV Wand. What is that, you ask? What magic does this little beauty perform? It is a miracle! I quote, “The Nano-UV stops the spread of infectious diseases.” WHAT? Are you flippin’ kiddng me? There is a wand that does this and no one told me? 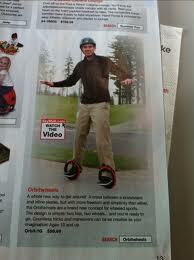 All these years we as a race of humans have been kept in the dark by the wicked Sky Mall vendors? The end to all disease! Right between the thing that ages new wine in just seconds (product ORD101J) and the vibrating neck massager (Product CDA101AJ). Do doctors know about this? Has someone informed the Surgeon General? Why aren’t we all carrying this thing with us at all times? I’m reading it in black and white. It’s in print, so it must be true. It says it prevents everything from “…the common cold to flu viruses to deadly E. Coli and Asian bird flu.” REALLY? I want one! I want one! I’m bouncing in my seat. YESSSS! It’s a steal, too. I can get the pocket scanner for $59.99 or (if he really loves me) I can get the bigger non-portable version for $159.99! Wow. This product is truly amazing. It says I can use it on mattresses, pillows and carpets in home OR in hotel rooms! What the frack? It’s like it’s giving me permission to be insane! How cool is that? How is it I have never heard of such a thing? Or better yet…why don’t they just put these things in the ceiling of every building in America right next to the fluorescent light fixtures and between sprinkler heads? Why is there not one above me on this plane between the dirty-air blower and the Call button? Or, or, or…maybe I should read the small print…Nah, I rather just live in my head where some magic wand kills all the germs. The picture in the ad contains an UP CLOSE (magnified a gazillion times) picture of dust mites, lice and flea eggs. This is visual bullying, dammit! This is not what I need to see while sitting on an airplane. These flying Petri dishes are airborne breeding grounds. I bet there are lice, dust mites and flea eggs on this very seat. Suddenly, I thought I felt the critters underneath me multiplying—or having a party, playing tiny steel drums, doing the Macarena or toasting each other before they procreate…or something even more sinister involving dividing themselves into two. I suddenly had an irrepressible need to douse my hands with Purrell. Oh Sh*t! My (less than 3 oz, airline approved) hand sanitizer is in the same carry-on bag with my M&M’s. Have I told you that I really hate to fly? I glare at my husband who’s snoozing without a care in the world. I accidentally knock his arm off the armrest. He startles and looks around. I look thoughtfully at my magazine never lifting my eyes. How can he sleep in a moment like this anyway? To distract myself from the tiny horrors fornicating and producing offspring all over my seat, I turn the page. Here’s another item that I must admit I thought was really cool–until I saw the price for ‘cool’ and then I thought of ten other ways I could spend that money. Item MMR102 J is called The Pure Fun Magic Showerhead. Ahhh…got your attention now, didn’t I? Well, put your libidos in check, ‘cuz it’s not that kind of fun—or at least I didn’t think so at first. This little device uses lights to illuminate your showerhead by producing a variety of changing colors through the magic that is LED technology. Here’s a line from the actual description. I am not making this stuff up. “New Disco versions create a club like experience with four flashy colors.” That line made me shiver as I pictured myself naked in a Disco full of flashy colors. It was not the kind of experience I’d like to try. But, still…wouldn’t it be cool to have your water change colors while you showered? Okay, maybe if it were $5.00 or something, yes. However, this little device can run you between $59.99-$99.99. The difference between the price appears to be whether you want the ‘fixed showerhead’ or the ‘handheld party’ version. Just let your imaginations take you where that forty dollar difference lies. I’ll leave it at that. ONE MORE…On page 45, there is something I needed before my sons left the nest and I was the only female in a house full of males. Product ITL170J is “a toilet seat that automatically raises and lowers the seat.” Wow! The product description alone is worth some money. “Some men have a hard time remembering to put the toilet seat down after use. Now the Touchless Sensor Toilet Seat is good news for your household. It raises the lid automatically as you approach the toilet.” (This makes me giggle and I don’t know why.) “Wave a hand over it one more time and the seat rises. Then both the lid and seat close automatically 30 seconds after you step away.” OMG! That’s priceless. Some brilliant woman engineer designed this in her basement at 3:00 am. I just know it. I could see her in her nightgown after she fell in one night when she didn’t want to turn on the light. I’m sure she stomped down to the basement with a wet bottom and angry face where she was determined to find a way to keep her marriage from crumbling and from killing her offspring. And the best part of this whole ad is the red box that exclaims “WATCH THE VIDEO! !” (Notice the exclamation points.) Of course. A video! Duh. I can’t even imagine what it means when it says raises and lowers automatically, can you? Do you need some sort of visual? Someone obviously thought you did! I wonder how long video is? I wonder if they show it in slow motion? Are there actors involved? I wonder if they show it several times or if they expect the viewer to keep rewinding it in order to watch the magic of a lid going up and down. If only I had my laptop, I could find out…crap! It’s with the M&M’s and hand sanitizer. Have I told you that I really hate to fly? Good one Krisitne!!! Tell Geraldyou need that magic wand!!! Wow…did not check my typing on the last post. Sorry about that!!! OMG! That was frickin’ hilarious! I was laughing out loud while my husband was looking at my like I had lost my mind since I was laughing at my computer…. Thanks, Amber. I kind of like the idea of your other half wondering what we’re up to. he he he. Terrific. Hope the return flight inspired a great blog too. I can’t feel I “forgot” to read your weblog because I observed it 3 months earlier. Also busy with perform I guess. Anyways I have it bookmarked now to be confident that I get notified when you place some new material up. Good one Kristine! Now you know why I carry a BIG carry-on purse that fits under the seat in front! My whole life is in that purse, from hand sanitzer, and wipes (for the tray tables you know), my snacks, plane tickets, book, husband’s meds, and just in case as has happened on a flight to Harrisburg, Pa., where the airlines lost our luggage, extra undies! Indeed that purse must weigh 15 lbs. But I am prepared. No overhead stash for me! As usual, excellent blog, K. I have to admit the white writing on the blue background sent my eyes all googly. But the read was worth it. I just love reading your blog! You paint such great pictures. Cheri Winter and I recently went on a trip and started looking through one of those SkyMall catalogs. We laughed so hard at some of the stuff in there. It was the most fun I have ever had on a plane. Reblogged this on I Should be Writing!.